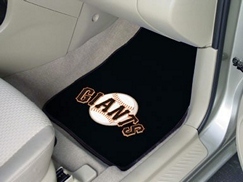 San Francisco Giants 2 Piece Carpet Car Mats. Made of 100% nylon material face with non skid vinyl backing. San Francisco Giants Carpet Car Mat - 2 Piece Set is chromojet printed in true team colors and designed with a large team logo. Carpet Car Mat Size : 17" X 27"